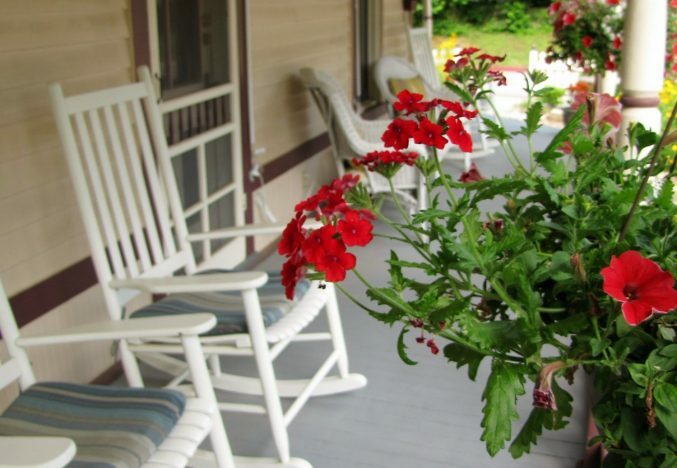 5 Ojo Inn Bed and Breakfast is located in Eureka Springs, Arkansas in the Ozark Mountains of Northern Arkansas. The variety of activities and attractions in the area, from antique shopping and live entertainment to hiking and fishing, make Eureka Springs, AR a wonderful vacation destination. Our inn’s luxurious Eureka Spring lodging is conveniently situated for day-trips to Branson, Missouri and Fayetteville, AR, which are both just an hour’s drive away. From Springfield, take Highway 65 South. About 10 miles past Branson, you will come up to Highway 86. Make a right. Stay on 86 for about 40 miles. You will then see signs for Eureka Springs and Highway 23 South. Take 23 South to your left. Stay on 23 for 11 miles. Highway 23 becomes Main Street in Eureka Springs. Stay on Main Street until you come to a stop sign (you will pass by the Train Station, some shops, the Grand Central Hotel, and then come up to a stop sign.) Go through the stop sign and travel about 1 block. You will see the Court House on your left. Across the street from the Court House is Benton Street that goes up the hill. Turn right on to Benton Street and follow it to the stop sign at the top of the hill. Benton dead ends into Kings Highway. Make a right off of Benton on to Kings Highway. There will be a small motel on your right, the Log Cabin Inn. After you’ve made the right in front of the Log Cabin Inn, you will follow Kings Highway for about 1/4 mile until you come to 5 Ojo Inn Bed and Breakfast on your left. Along the way on Kings Highway you will pass Rock Cottage Gardens and then the Hospital. Pull into the parking lot next to the 5 Ojo Inn Bed and Breakfast sign. To get to the office, walk in front of the Ojo House (where the parking lot is) and follow the office signs to the last house where the welcome banner is. Take Highway 412 from Tulsa into Springdale, Arkansas. In Springdale, you will come up to the intersection with Highway 71B, where you will make a right – then get into the center lane – as 412 picks up again shortly. Turn left back onto 412. Stay on 412 for about 18 miles. You will see a sign for Eureka Springs and Highway 45. Take Highway 45 to your left. Stay on Highway 45 for 6 miles. Highway 45 dead-ends into Highway 12, where you will make a right. Take Highway 12 for 6 miles, where it will dead-end into Highway 23. Make a left on Highway 23. You will travel Highway 23 for 11 miles, into Eureka Springs, where it will dead-end into Highway 62. Make a left on Highway 62 and go about 2 1/2 miles. When you get to the High School (on your right) and the Inn of the Ozarks (on your left), Highway 62 will curve sharply to the left, but you want to make a right. After turning right off of 62 you will make an almost immediate left on to Kings Highway, you will follow Kings Highway for about 1/4 mile until you come to 5 Ojo Inn Bed and Breakfast on your left. Along the way on Kings Highway you will pass Rock Cottage Gardens and then the Hospital. Take Highway 71 south through Joplin to Highway 60. Go EAST on Hwy. 60 to Monet. In Monet, take Hwy. 37 (south) toward Cassville. Pick up Highway 86 in Cassville, heading in a southeasterly direction. Highway 86 takes you through Eagle Rock, MO. Just past Eagle Rock, you will see signs for Eureka Springs. Take Highway 23 South (right). At this point, you are about 11 miles NORTH of Eureka. Take Highway 49 north towards Fayetteville. In Fayetteville, take exit 67 to Highway 71B. The exit will merge into 71B going North. Stay on this road for about four miles. You will get to Highway 412 which intersects with Hwy. 71B. Go EAST on 412. In Springdale, Highway 412 intersects with Hwy. 71B. Go EAST on 412. In Harrison, get on Highway 62 heading WEST. Take Highway 62 for approximately 45 miles, traveling through Green Forest and Berryville. Once you’ve gone past the Wal-Mart in Berryville, you are about 11 miles from Eureka. Highway 62 is the main east-west road through Eureka. Stay on Highway 62, traveling past a number of motels and fast-food places. You will pass by: Pizza Hut (on your left); McDonalds (on your left); a Texaco service station (on your left); Bubba’s Bar-B-Que (on your right); then the Eureka Springs High School (also on your right). When you get to the High School (on your right) and the Inn of the Ozarks (on your left), Highway 62 will curve sharply to the left, but you want to make a right. To get to Highway 62 East, take Hwy 49 to exit 86 and follow the signs to Hwy 62. Go about 2.8 miles until you come to a stoplight where you will have to turn left on to Hwy 62. Follow Hwy 62 into Eureka Springs. As you get into town, you will pass the Joy Motel on your left. Then you will see the Best Western Inn of the Ozarks on your right just as the road makes a 90 degree turn to the left. Just after making the turn in the road there will be another 90 degree turn to the right. Do not go right. There is a road to the left off of Hwy 62 you will be taking. It’s Kings Highway, but you can’t see the street sign until you actually turn. Just follow the hospital signs and head towards the Log Cabin Inn.